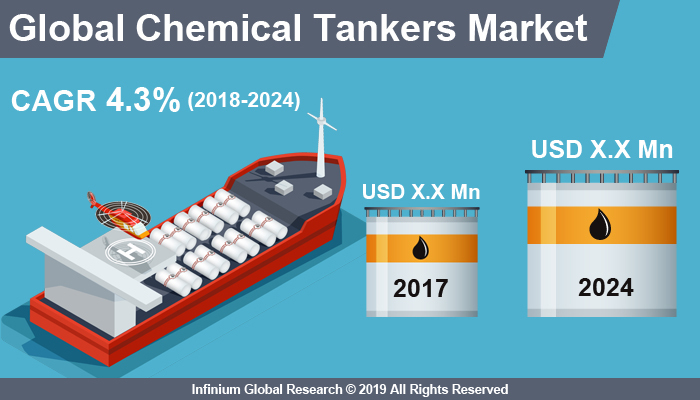 A recent report published by Infinium Global Research on chemical tankers market provides an in-depth analysis of segments and sub-segments in the global as well as regional chemical tankers market. The study also highlights the impact of drivers, restraints, and macro indicators on the global and regional chemical tankers market over the short term as well as long term. The report is a comprehensive presentation of trends, forecast and dollar values of global chemical tankers market. According to the report, the global chemical tankers market is projected to grow at a CAGR of 4.3% over the forecast period of 2018-2024. Chemical tankers are cargo ships designed for the carriage of any liquid chemicals in bulk. Theses tankers transport chemical in various forms. Chemical tankers are specifically designed in order to maintain the consistency of the chemicals they carry aboard them. These tanker ships are applied with coatings of certain substances that help in the easy identification of the chemicals that need to be transported. Oceangoing chemical tankers range from 5,000 tons’ deadweight (DWT) to 35,000 DWT in size. Chemical tankers have a series of separate cargo tanks which are coated with specialized coatings such as phenolic epoxy or zinc paint, or made from stainless steel. The chemical tanker is classified into various types includes product tankers, parcel tankers and dedicated chemical tanker. Product tanker carries non-dangerous chemicals as well as petroleum goods and parcel tanker used to carry only a specific chemical in bulk. Nowadays, the range of chemical shipped in bulk has grown massively and specialized ships have developed to meet the need of the chemical tanker. Transportation of bulk chemicals by sea not only requires specialist ships and equipment but also specialist crew training, both theoretical and practical, in order to understand the characteristics of the various chemicals. Sea is one of the only methods of transporting chemical in bulk quantities across the oceans. There are various cargo ships, which specialize in carrying chemicals across the oceans. The increasing use of chemical across various end-user industries is driving the growth of the global chemical tankers market. A modern chemical tanker is primarily designed to carry several hundred hazardous products covered by the International Maritime Organization (IMO) Bulk Chemical Codes. Moreover, growing regulation towards the safe shipment of hazards chemicals is escalating the chemical tankers market. However, less number of fleet addition and estimated scrapping of existing ships in hindering the chemical tankers market. In addition, increasing chemical industries leads to large-scale chemicals’ production. Which in turns, creating opportunities for the global chemical tanker market during the forecast period. Among the region, Asia Pacific dominates the global chemical tanker market and is expected to have a significant growth rate during the forecast period. Due to spurring demand for petrochemical from developing countries such as India, China, and Singapore. Additionally, a growing number of chemical industries in South Korea and Japan have positive impact growth of the market in the Asia Pacific. The rapid growth of the shale gas industry is anticipated to lead the demand for the chemical tanker market in the North America region. The U.S. is a major contributor to the chemical tanker market owing to the increasing number of shipbuilders and fleet owners. The Middle East has established petrochemical reserves. Africa region is growing at a significant pace in the chemical tanker market. The report on global chemical tankers market covers segments such as product type, fleet type, and fleet size. On the basis of product type, the sub-markets include organic chemicals, inorganic chemicals, and vegetable oils & fats. On the basis of fleet type, the sub-markets include IMO type 1, IMO type 2, and IMO type 3. On the basis of fleet size, the sub-markets include inland, coastal, and deep sea. The report provides deep insights into the demand forecasts, market trends, and micro and macro indicators. In addition, this report provides insights into the factors that are driving and restraining the growth in this market. Moreover, The IGR-Growth Matrix analysis given in the report brings an insight into the investment areas that existing or new market players can consider. The report provides insights into the market using analytical tools such as Porter's five forces analysis and DRO analysis of chemical tankers market. Moreover, the study highlights current market trends and provides forecast from 2018-2024. We also have highlighted future trends in the market that will affect the demand during the forecast period. Moreover, the competitive analysis given in each regional market brings an insight into the market share of the leading players.